I’ve been wanting to go here for ages. That’s a view from our house. Known locally as “the meadows” it’s where the bare white rock meets the green on the upper eastern slopes of La Maroma. In winter when the mountain is snowcapped the snowline extends just beyond this area and the locals drive up with their children to play in this winter wonderland. In spring this flat green area is usually carpeted with wild flowers. Here’s an aerial shot. That’s our local village Sedella basking in the sunlight. From Sedella take the MA-127 road to Salares. As you come down the hill approaching the village, take the first (top) entrance to the village. You then take an immediate left, the first track you come upon going fairly steeply upwards. Continue on this for about half an hour until you see a track on your left. There is an old sign saying “Prohibido pasar” – ignore the sign and drive on up. It feels a bit hairy at times for sure, though if you’ve driven on tracks in the Axarquia at all this is no different. Just hang in there and keep going, you’ll keep climbing and climbing steadily. Don’t forget to roll all the windows down and let the gorgeous aroma of the pine trees fill the car. All of a sudden (after 20 minutes or so) you’ll come to the end of the tree line and emerge on to the sunlit meadows. To be honest I was a bit disappointed at first as there were no flowers at all. No surprise though as we’ve had very scant rain since the end of last summer. But the open space! When you live on the side of a mountain and the only flat space you are used to is the floors of your actual house then a big open clearing like this is a real treat. The children loved it, they shot out of the car and sped off in to tiny dots within seconds. And the views! At 1,500m or so we were just 500m from the summit of Maroma (2,065m). Here we are looking south over the Mediterranean haze. You’ll definitely need an extra layer up here. It was about 10 degrees colder than in the village and there was a strong breeze. The path to Maroma, a mere 2 hours stroll from this point, winds away tantalisingly in to the distance. I think this path is the Robledal route (from the northern Zafaraya side) to Maroma. Then we spotted some wild horses peacefully grazing on the south-facing slopes. I managed to get up really close for this killer shot (if I do say so myself) with the snow-capped Sierra Nevada just peeking through. Magic. Wow great post and great photos. Beautiful. Thank you so much Tric! The stone circles are very like the fairy forts in Ireland. Not so many high-altitude grazing horses here though!! wow! amazing photos! definitely want to head up the mountain next time I’m in sedella….can’t believe it’s so easy to get there. Hi David, Sedella is a tiny village in the mountains so with all the charm that implies inevitably comes a lack of services. There is a local teacher who gives flamenco classes and they put on performances for big events like the annual feria, San Anton, Christmas etc. A doctor attends 2 mornings a week at the consultorio; no dentist, plenty on the coast half an hour away. Malaga city is an hour’s drive. There is a restaurant ‘Lorena’s’ and a bar/restaurant ‘The Chiringuito‘ plus a few more bars that serve tapas. 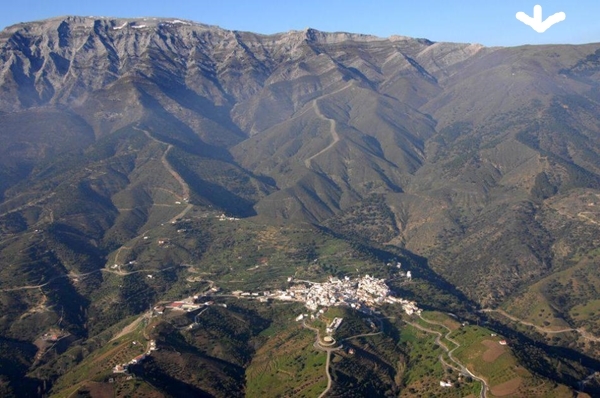 The next village Canillas de Aceituno, 15 mins drive, has a lot more choice for eating out, or Competa, about 20 mins the other direction. Shops… sorry, there’s nothing, just 2 tiny food shops but very basic. There’s no ATM either. It’s really not toursity at all. Buy hey, it wouldn’t be a beautiful traditional village if it had all of those things.